As part of the commemoration of the thirtieth anniversary of the parinirvana of Chögyam Trungpa XI Rinpoche, two videos have been uploaded to the Konchok Foundation youtube channel. This is the first appearance of these videos on the internet; they were previously only available in DVD format. 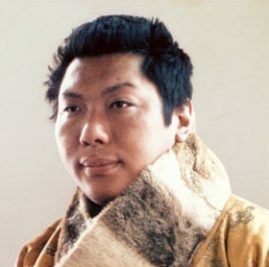 Glimpses of Chögyam Trungpa Rinpoche’s Life and Legacy in Tibet is a 42 minute video, made in 2011, that incorporates interviews with Chögyam Trungpa’s brother and others who knew him in Tibet before 1960, as well as brief comments by his successor, Choseng Trungpa XII Rinpoche. Songs from the Kagyu Gurtso (Rain of Wisdom) is a 17 minute video, made in 2010, of Surmang monks, led by Karma Senge Rinpoche, chanting several selected songs from this collection. The Kagyu Gurtso (Rain of Wisdom) is a renowned collection of wisdom songs by lineage holders of the Kagyu school of vajrayana Buddhism. Chögyam Trungpa Rinpoche was instrumental in this collection becoming available, translated into English, in the West. The Konchok Foundation is pleased to assist Surmang Dutsi Til monastery, the home monastery of the Trungpa lineage in Tibet, in its commemoration of Eleventh Trungpa’s parinirvana by providing to them seven large panels summarizing Chögyam Trungpa Rinpoche’s life. The panels were created by a team led by David Garrett. The five pages linked on our Life and Legacy of Chögyam Trungpa feature the contents of the five panels having to do with his life in Tibet. An update with the latest news about Surmang and the Surmang shedra will be coming soon.